Research group Tractica projects a 50 percent increase in telepresence in four years. By 2020, instead of Skyping with colleagues or distant friends and relatives, you may be chatting through a mobile, interactive robot. At least that’s what a new report suggests. Telepresence robots are forecasted by the technology intelligence research firm Tractica to reach 31,600 units by 2020 — a growth rate of 49.7 percent from the current 4,200 count in 2015 — with cumulative shipments over the next five years expecting to total nearly 92,000. Telepresence robots go beyond Skype, too: These are personal and mobile teleoperatic robotic systems, meaning they are computers with wheels that you can listen and talk to. Wendell Chun, the author of the report, expects these teleoperatic bots will roam around all sorts of industries, particularly in hospitals and schools. Right now, a quarter of all hospitals in the United States have telepresence robots and are also being sold abroad as well, says Chun. 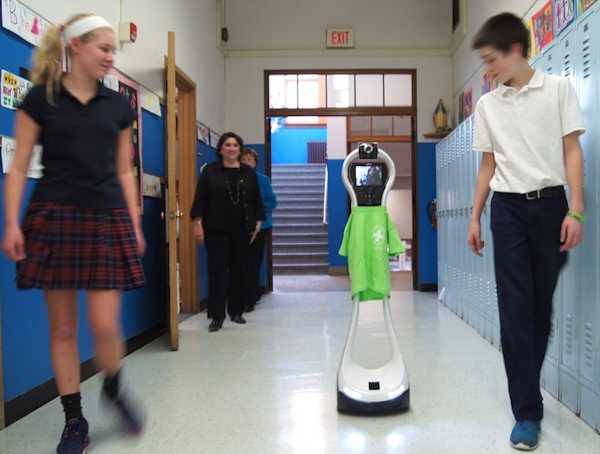 The largest telepresence robot companies in the United States focus on telemedicine systems, one of them being InTouch Health in Santa Barbara, California, which built the RP-VITA autonomous robot in 2013 — the first telemedicine robot to be FDA approved. “If you can have any specialist anywhere in the world at your fingertips anytime you want, the cost [of telepresence robots] tends to be minimal to hospitals,” Chun says. Chun also described how the education sector will experience an increase in telepresence robots as more classes are being led by teachers remotely. In Korea, Chun learned that teachers in the Philippines are using telepresence systems to teach students English because of the lack of qualified teachers in Korea. However, other applications still might feel like science fiction to some. The awkwardness of being present via robot has been a challenge companies have faced since the beginning of telepresence robotics. Thirty years ago, Chun tried out one of the first telepresence systems called Greenman, an aviator helmet that had 525-line video cameras that linked to a dexterous exoskeletal robot. The anthropomorphic manipulator was built by SPAWAR Systems Center San Diego in 1983 and was a project for the Navy. Today, telepresence robots are priced for purchase or rent anywhere between $5,000 to $200,000, Chun says. While his research suggests the telepresence market is valued at $4 billion, he estimates that it’s actually about half when factoring in conservative assumptions. Still, there is a lot of promise in the near future. Chun recorded 20 telepresence robot patents in 2014, and projected 36 patents for 2015. Additionally, the United States remains the dominant market, but Chun is seeing expansion in countries in Asia and the Middle East.